This fun set of three black and gold New Years badges make perfect party favours. You get 3 cool party designs. 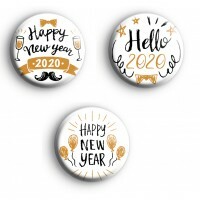 The first badge has Happy New Year 2020 written in a black and gold font and cute bow tie, moustache and champagne glass illustrations. The second badge has Hello 2020 written in a gold & black text with stars around the edge. The last badge in the set has the message Happy New Year written in a black font and gold balloon illustrations at the side. This badge pack would make the ideal party keepsakes and a fun reminder from New Year's Eve.